At last, a Tiger shark! As I kneeled on the sandy bottom, peering through my viewfinder, I felt a bump on my foot. I looked around and saw I was surrounded by five Tiger sharks ranging in size from 6 to 14 feet, not to mention about twenty Lemon sharks. It was noon and I was already on my third tank of the day. We had no cage, no protection, bait all around us, and more sharks than I could possibly hope to keep an eye on at once. For some people this would be a nightmare. For me--heaven. I had been waiting for this moment of Tiger shark nirvana for twelve years. As a professional underwater cinematographer and photographer, my work may seem similar to other people's hobbies. The difference is, I need to get the shot to pay the mortgage. When I am shooting stills, I enjoy subjects of all sizes from the tiniest seahorse, to the most colorful nudibranch to the biggest whale. Early in my career I realized that no matter how much I liked my nudibranch portfolio, very few people wanted to buy pictures of nudibranchs. Even fewer networks wanted to make films about them. Sharks on the other hand are not only popular, but also help pay the mortgage so I began to concentrate on capturing them on film. I am very lucky to be a professional underwater cinematographer. People actually pay me to fly off to the far corners of the Earth to shoot underwater nature films. That's the fun part. The other, less glamorous part of my job, is sitting in front of computer editing a film or writing proposals, scratching my head wondering how to make a documentary about nudibranchs sound exciting. Between films, I usually take a few months off, do some writing, let the stress of film deadlines wear off, and engage in a little dive adventure travel with no video camera in sight. In the mid 1990s I noticed that there were only a handful of decent Tiger shark pictures out there. The same ones got published over and over. I didn't have any pictures of Tiger sharks, so I set out to photograph them. I was in the mood for an adventure. How hard could it be? If I had only known. After some research, I realized that there was no place in the world where divers regularly interacted with Tiger sharks. I asked around, and learned from a highly-respected underwater photographer friend that he had a hard time photographing Tigers on a big-budget assignment for National Geographic Magazine in Australia. Maybe there was a reason only a handful of decent pictures existed? In the 1990s, one of the only places known for consistent Tiger shark activity was Midway Atoll. Every year, Tiger sharks aggregate around the time of the albatross fledgling season. The big sharks wait in the shallows as the young, gangly birds learn to fly. When an albatross crash-lands in the shallows, the hungry Tiger shark erupts from the water beneath it for a nice meal. Wouldn't this be an amazing image to capture? Unfortunately for me, Midway Atoll was not officially open to tourism and no facilities existed there. To go there I would need to charter a large private boat to make the 1,200 mile journey from Honolulu. I looked into my wallet and realized that I couldn't pay for the trip with the dust bunnies that fell out so I put the idea on the back burner. In 1995, on a trip to photograph dolphins on the Little Bahama Bank, I met Wayne Scott Smith, famous for his interactions with wild Atlantic Spotted dolphins. During the week on the liveaboard, I was chatting with Captain Scott about Tiger sharks and he pulled out a scrapbook filled with dozens of pictures of Tiger sharks all taken in the Bahamas! He knew where to go and how to chum up big Tiger sharks! When asked if he would allow me to charter the boat for a Tiger shark trip, the answer was a resounding "No." He had a successful business doing dolphin charters and didn't want to work with big aggressive sharks. I sulked. It didn’t help. A few years later, while working in the Bahamas on a dive magazine story about Walker's Cay and their amazing shark dive, I ran into film maker Marty Snyderman and shark biologist Rocky Strong, in the middle of a month-long film shoot there. They were filming sequences about Tiger sharks for a shark film for PBS Nature. I asked Rocky if there were enough Tiger sharks to get the job done and his reply was "I'll tell you Jonathan, now that I have seen how many Tiger sharks are in the waters of the Bahamas, I would never swim here at night!" That was good enough for me! But I still needed an operator that was running Tiger shark dives, or would run one for me. I even contacted shark researcher Dr. Sonny Gruber and inquired about using his shark research facilities and expertise in Bimini. Alas, his fees were too steep for my budget without a film project to pay for it. It seemed as if the Tiger shark would remain out of reach for a while. In 1998, while photographing whale sharks in Western Australia, I took some time off from chasing the big, polka-dotted plankton eaters to do a reef dive at Ningaloo Reef near Exmouth. As I swam along the bottom looking at the coral and fish, movement caught my eye. I looked up and saw a large shark approaching. The big square head made me think it was a small Whale shark headed my way. Yet, as I continued to study the approaching shape, I realized I was seeing my first ever Tiger shark! Many thoughts go through a photographer's head at a time like this, not the least of which is "Don't screw it up, don't screw it up!" I would only get one chance. I needed to ascend to get to the depth of the shark before it passed over me, make no noise, approach silently and smoothly, compose a single perfect frame, and fire, with perfect exposure. All this had to happen in less than 10 seconds. I gently started towards the shark. Just before it came into photographic range, the shark saw me. I literally “scared the crap” out of the shark. It defecated, turned around 180 degrees and took off like a bolt of lightning. I hung my head in shame. Somehow, I blew it. The worst part was that nobody on the dive boat believed me. The divemaster said they had never seen a Tiger shark in 20 years of diving at Ningaloo Reef. Two years later, in 2000, I learned some exciting news. Midway Atoll was now a tourist destination! A company had developed a hotel from the old military barracks, a dive shop and mess hall, and set up weekly flights. I immediately started working the phones and arranged for a magazine assignment to produce a story about Midway. Fortunately, my plans coincided nicely with the albatross fledgling season. Coincidence? I don't think so! So, there I was, five years after I had begun my quest to photograph Tiger sharks and I finally had a decent lead! Sport Diver Magazine was kind enough to send me on assignment to Midway Atoll. My friend Al Bozza, serving as an assistant, flew to Midway with me. We got settled into our rooms. Then, after pumping the staff for information, we headed over to the beach where the Tigers normally stalk the shallows, hunting birds. Within 10 minutes we saw the shadow of a Tiger shark. I watched and waited. No birds crash landed. The shark merely paced back and forth, waiting. I put on my mask, fins and snorkel and quietly waded in, ignoring my “no snorkeling with sharks” rule, and nervously wondering if I was about to do something incredibly stupid. Nikonos camera in hand, I swam towards the dark shape in the water. Underwater, I could not see the shark. I looked back to shore where Al was pointing to the shark. I swam in the direction he pointed. Still, I saw nothing. I looked back and Al pointed the other way. I swam again. After about 15 minutes, I realized that the shark had a pretty good idea of exactly where I was, and fully intended to avoid me. I dragged myself out of the water in defeat. I asked the staff if I could chum for them and they said absolutely not! The last thing they needed when the resort first opened was news of a Tiger shark eating a guest! Later in the week, on the dive boat coming back from a dive, I looked down and saw a large shark beneath the boat in the lagoon. I screamed for the captain to stop. I put on my gear quickly and dropped into the water in front of the shark. It got one look at me and took off, like I had shark repellant. So much for the terrible Tiger sharks of Midway! I came away with a nice story for the magazine about Midway, and about ten zillion pictures of albatrosses, but not a single photo of a Tiger shark. I realized that I had a real challenge on my hands. Shortly afterward, Jim Abernethy in Florida became known for reliable Tiger shark encounters in the Bahamas at the Little Bahama Bank, exactly where my friend Captain Scott had been seeing them for many years. Every underwater photographer in the world went out on Jim's boat and photographed Tiger sharks. Within a few months, pictures of Tiger sharks went from rare to common. Every professional underwater photographer had a couple hundred decent Tiger shark pictures in his or her library. For me, the motivation to produce stock photos of Tigers was gone—the market evaporated as the supply exceeded the demand. Tiger shark pictures had become as common as Reef shark images. 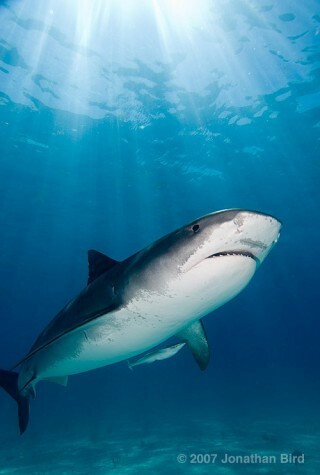 Still, out of pure stubbornness, I wanted to photograph a Tiger shark. It was now a quest to prove that I could get pictures of them. I put a Tiger shark trip to Little Bahama Bank on my "must do" list. In 2004, I spent a week on Captain Scott's brand new larger boat doing some dolphin work and I decided to give him a hard time about Tiger sharks. I asked again if he would do a Tiger shark trip for me, and this time he finally relented. I asked him why he changed his mind after almost 10 years of saying no, and he admitted that he thought it would be fun, he had a larger boat to pay for, and Jim Abernethy was doing it safely, so why not? It seemed safe enough. So I booked the boat for November 2005. As the dates approached and hurricane season wound down, I got very excited about going to the Bahamas and finally seeing Tiger sharks. The week before our trip, Hurricane Wilma blew through Florida and made a mess of the place. On the first day of the trip I flew to Florida and met a dozen friends who had signed on with me for the ultimate Tiger shark trip. The seas were calm, the storm long gone and the forecast predicted sunny skies and beautiful weather. We made the crossing to the Bahamas overnight and started chumming. To make a long story short, we chummed for 9 days, and only got one Tiger shark around the boat. It was too skittish to come near the divers. All we got were surface shots. Talk about depressing! Clearly, Tiger sharks didn't like me. Maybe they had a convention and unanimously decided to avoid me? I seemed to have the worst luck in the world with Tigers. When all else fails in diving you can blame the weather. There could be no other logical explanation except that the storm had driven the sharks into deep water. Even at the sites where reef sharks usually arrived in abundance when chum hit the water, the sharks didn't come. We went home empty-handed. I sulked some more. Still didn’t help. My friends thought I had done one too many deep dives when I booked Scott's boat again for a Tiger shark trip. Now it was personal. I needed to photograph Tiger sharks just to prove I wasn't jinxed! I called some friends and asked them if they wanted to participate. Not surprisingly, I had a hard time getting anyone interested. My good friend Pierre had absolute faith that we would see them on the second trip, and was the first to sign up. But as the trip loomed closer and closer, I still had vacant spots on the boat. I talked to my longtime friend and supporter Bob Evans, the genius behind Force Fins, and told him that I wanted him to come on the trip, no excuses. I promised him big sharks, lots of laughs, and of course the chance to finally dive together. Although I had known Bob for over 15 years, we had never once been diving together. Besides, Bob has good karma. I knew that he would bring the good luck we needed. The shark gods might not mind messing with me, but they wouldn't do it to Bob. He's just too nice a guy. At last, we flew to Florida to board the boat again. The year was 2007, twelve years after I first decided I would like to photograph Tiger sharks. We crossed the gulf stream to the Bahamas, started chumming and settled in for what I thought would be hours or even days waiting for sharks. Fifteen minutes after the chum hit the water, someone yelled "SHARK!" from the back deck. We all raced out to the swim step. Within 30 minutes we had 3 Tigers and a pile of Lemon sharks. "So who wants to go in?" Scott asked, as he heard the sound of a giant splash behind him. I was already on my way to the bottom. We spent 6 straight days photographing Tiger sharks. Believe it or not, some people on the trip actually grew bored of diving with Tiger sharks! I had recently switched over to shooting digital and I managed to take several hundred Tiger shark "keepers" a day. At the end of the trip, I had over 1,000 decent Tiger shark images. The shark gods finally smiled on me. It only took 12 years, four trips, 35 diving days and more than $20,000.00 to get these images. Sometimes, patience really is a virtue. My quest had ended. Honestly, I think the real trick was having a secret weapon. I had Bob! And by the way, I don’t think I have ever licensed one of my Tiger shark photos. Anyone want to buy a picture of a nudibranch?